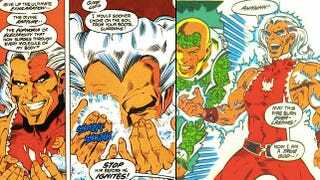 When it comes to obscure DC Comics supervillains, few are as celebrated as Snowflame, a Colombian bad guy who debuted (and died) in 1988's New Guardians #2. What made Snowflame so memorable? Well, he was a crime lord who obtained superhuman powers from inhaling copious amounts of cocaine. Upon getting high as hell, Snowflame would scream about how cocaine was his god, all the while dressed like the Secretary of the Interior for the Ice Capades. He seems to have a sort of personal, if warped, sense of honor, and to some degree enjoys hanging around his cronies/entourage. Comics often feature introspective characters who feel alone because of their super-abilities, so it's interesting (to me, at least) to see a character with such effed-up powers totally living it up and enjoying people. Sydor understands that the appeal of Snowflame comes from depicting the villain as a legitimate threat who incidentally happens to be fueled by mountains of toot. Therefore, you have characters like Batman and Green Arrow withering before such quips as "I work for no one but cocaine!" and "You know nothing of the union with my god!" The whole affair is wonderfully stone-faced. You can read this amusing labor of love starting here. Maybe Snowflame will now get his due in DC Comics' rebooted New 52 universe. Hat tip to Collex! Semi-related: The time Wolverine fought a mountain of living cocaine.